^ Lead View Table 互联网档案馆的存檔，存档日期2009-01-12. ^ 2.0 2.1 2.2 Southampton museum of Archeology. Gods House Tower, Southampton. ^ Greenwood & Co. Map of the County of Southampton. 1826 [2007年9月21日]. ^ John Marius Wilson. 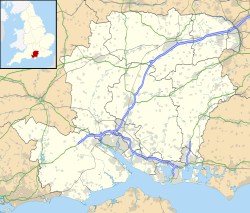 Southamptonshire. Imperial Gazetteer of England and Wales. 1870 [2007年9月21日]. ^ Southampton Boat Show. 南安普敦市議會. 2007年5月16日 [2007年7月28日]. （原始内容存档于2008年9月13日）. ^ 英國內政部. Local Authority Crime Statistics. [2007年9月10日]. （原始内容存档于2009年12月7日）. ^ Average Weather for Southampton, ENG. [2007-08-03]. （原始内容存档于2011-05-22）.